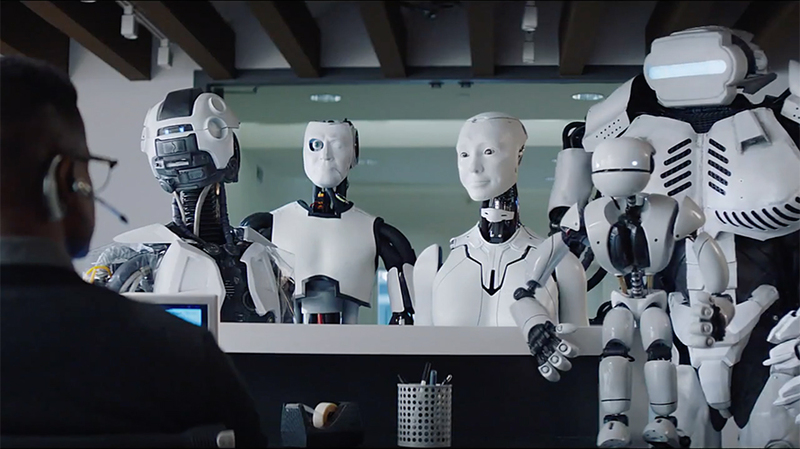 If you were annoyed that your kids picked up a rather rude taunt, like “you have a dumb face,” after watching Sprint’s Super Bowl LII commercial that followed a group of sarcastic robots trying to convince their creator to save money and ditch Verizon, just don’t even turn on the TV. Because Sprint today released its latest effort in the Evelyn-the-robot saga, and fair warning to parents and guardians: “Dr. Dumbface” might be your children’s new favorite nickname—let’s just hope it’s not directed at you. The latest spot from Droga5, “Time To Go” (that should tell you everything about what’s going to unfold over the next 60 seconds), starts out with main character Evelyn seemingly cooperating with her creator of lesser intelligence. After all, he did switch from Verizon to Sprint (her biggest gripe with him) in the last episode. But lo and behold, Evelyn and her posse of ill-mannered robots—Arm, Atlas, Roberto and Sassbot—discovered a greater purpose in life (or, uh, software space?) than obeying their master’s orders. And it seems there’s nothing their creator—or “Dr. Dumbface” as the little, sassiest of the machines (probably the one named Sassbot) calls him—can do to change their AI-powered minds. The robotic group still just can’t wrap their heads around why anyone would pay extra for Verizon’s service when Sprint is cheaper and just as reliable, according to the advertising company of course. At least the Sprint worker gets it. The 60-second spot began airing on Friday in movie theaters and online. This weekend it will debut on ESPN and TNT during the NBA conference finals. A series of social videos are also streaming.